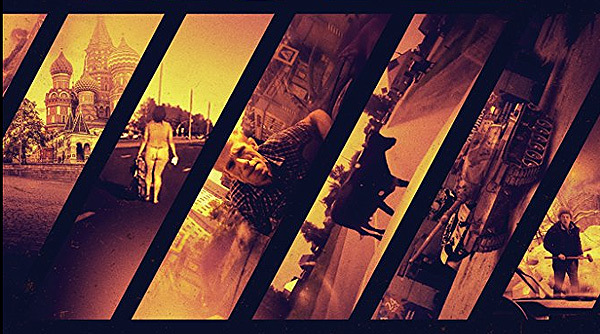 The Road Movie is a full length documentary film (watch trailer below) with a release date of 2016, 2017 and 2018 depending on where you are, put together by Belarus / Russian film maker Dmitry Kalashnikov and distributed by the independent film company Oscilloscope. Russians are subject to some of the highest accident rates in the world, but they can also afford modern technology such as dash cams to help with insurance claims unlike other accident-prone countries such as India, where the average citizen can barely afford a smartphone. Russia is also home to some of the worst driving conditions in the world. Whether it be slippery, ice-covered roads or smog so thick that you can’t see the vehicle in front of you, driving in the former soviet union is not for the faint hearted. Add in a couple of farm animals, psychopaths and drunks and you have the last place you want to be driving in. The documentary starts off fairly tame, providing context and structure as opposed to immediately slapping you with recording after recording like a dash cam YouTube compilation video would. The constant hum of the roadway and it’s inhabitants provide the perfect soundscape to accentuate the scenic, snow-covered trees that line the country’s roads. A couple of near misses, small bumps and avoided cows later, the action begins. From rapid fire cuts of brutal overturns and hard hitting rear ends to painfully dragged out head-on collisions and panic inducing drives through wildfires, The Road Movie provides more than enough chaos to make your heart skip a beat every now and then. One thing that makes it difficult to look at The Road Movie as, well… a movie is that it doesn’t contain any additional music, voice overs or even text, bar the dash cams’ built-in timestamps. There’s no cast so to speak, nor visual effects or editing other than the simple cuts. The only music you hear is the usually cheery Russian music that plays through the driver’s radios. You often hear the driver’s voices as well, which helps bring back a sense of humanity to what is otherwise a creepily ominous film. Even when you don’t understand what they’re saying, their noticeable emotions usually provide enough context for you to realize what’s going on. This is especially apparent in one clip where a woman becomes increasingly nervous as she watches her husband drive through a smoke-drenched road surrounded by wildfires. “Stay in the middle!” She insists as he avoids a falling tree engulfed in flames while trying to traverse the mess. You end up panicking with the people in the videos, praying for their wellbeing all while knowing there’s nothing you can do and that whatever does happen actually did happen, because every clip is as real as it gets. There is no CGI, no ridiculous stunts or superheroes to save the day. The lack of exposition helps you develop your own perspective on what’s going on, keeping you engaged throughout the experience. This helps make certain portions of the film quite harrowing. There’s no gore per-se, as Dimitrii has either done a good job editing those portions out himself or the dash cams fail to capture the footage, but the head-on collisions often appear to be fatal. However with The Road Movie being featured in cinemas and eventually coming to DVD, you can be rest assured that nobody actually died. The end credits are the only other portion of The Road Movie that really make it a movie, as they show you the usernames, view counts and titles of all the featured recordings. With all that’s on offer here, you’ll likely come for seconds, especially considering that you’ll probably miss a good portion of the quick fire cuts. Compilations of people having accidents, failing to do everyday tasks and just being outright stupid are extremely popular all over the internet, with some videos raking in millions of views from spectators around the world. The premise of watching other people endanger their lives and suffer from the comfort of your own home has become more acceptable as a result. There’s something sick, even unnatural about that, but such is the world we live in. Dimitrii Kalashnikov knows this, which is why he created The Road Movie, a feature film length compilation of dash camera footage. 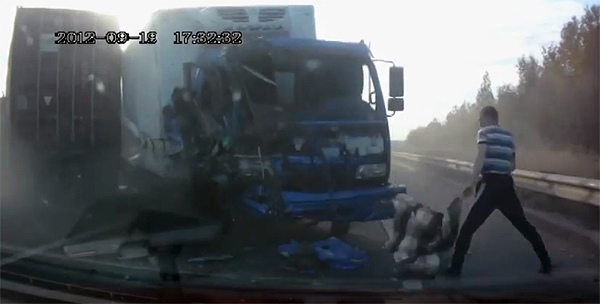 These recordings namely take place in Russia, where the majority of the accidents you used to see, before dash cams started to become popular in the US. There aren’t only accidents and near-misses though. Dimitrii has included a few additional pieces of dash cam-recorded footage that shows some of mankind’s worst traits. Whether it be rage, fear, arrogance or downright ineptitude, you’ll find it here. One clip features a man jumping onto the hood of a woman’s car and clinging on like a zombie as she shouts at him and begins to drive. Another features an elderly woman who thought it’d be a good idea to use a lighter right on some petroleum at a gas station. The aftermath isn’t visible as the vehicle the dash cam recording the footage on is driven out as fast as possible to avoid being engulfed. All the recordings you see in The Road Movie take place after 2011 and vary in quality. A certain level of which is upheld for the sake of being viable for film standards. Not everything featured in the film ends in turmoil, though. A few less chaotic recordings are edited in to keep things interesting and provide the occasional breather. This also adds a sense of mystery to the videos, as you never know which one is going to be another day for the driver, or one of their worst. Sometimes you’re left to figure out what happens next on your own. While frustrating, its understandable given the type of content you’re watching. For example in one cut a woman forgets her baggage in a taxi and hops into the next driver’s car to chase down the taxi and obtain her belongings. But we never find out what happens in the end. It’d be foolish to look at The Road Movie as nothing more than a well stitched-together compilation. Kalashnikov made this film with the intention of pointing out how society’s desensitization has hit an all time high, one where we can make a film, a form of entertainment, where real people go through traumatic experiences no real controversy sparks.